What is the Energy and Policy Institute? The Energy and Policy Institute (EPI) describes itself as a think tank and a watchdog organization. One of EPI’s top goals is to reveal the hidden influence of fossil fuel and utility companies. At the same time, however, EPI is opaque about its own funders. Campaign for Accountability’s new report, What is the Energy and Policy Institute?, reveals that the Energy and Policy Institute is just as secretive as the organizations it exposes. EPI is a dark money group: it does not appear to have nonprofit status, it is not registered with any relevant secretary of state, and no one admits to funding it. It appears that EPI may be simply the creation of a public relations firm. Nevertheless, journalists treat EPI as they would any other watchdog organization. To accomplish this mission, EPI profiles “front groups” that work to advance the goals of the fossil fuel industry – fourteen such groups are profiled on EPI’s website. EPI relies on investigative journalism techniques to trace the funding for these groups back to oil and gas companies and utilities. 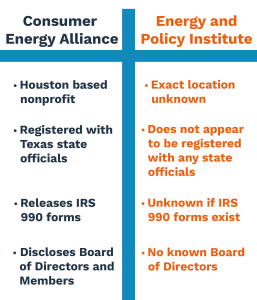 For instance, EPI has profiled the work of the Consumer Energy Alliance (CEA), a Houston based nonprofit that claims to be the voice of the energy consumer, but “really is a fossil fuel-funded advocacy group” run of the offices of a public relations firm. Recently, EPI published an article criticizing CEA for issuing a press release regarding poll results showing support for a proposed natural gas pipeline in the mid-Atlantic without disclosing financial support from companies interested in seeing the pipeline go forward. While its criticism may be accurate, CEA is more transparent than EPI. CEA actually is a bona fide nonprofit that releases annual tax returns as required by law – something that EPI does not do. CEA also discloses its board of directors and, notably, its members. EPI’s work on CEA includes posts and reports regarding CEA’s funders, which CEA itself discloses as members. In contrast, EPI does not disclose any information about its support. The comparison between EPI and the CEA is illustrative. EPI is a self-styled watchdog and a think-tank, two categories that typically apply to 501(c)(3) nonprofit organizations. Such charitable organizations are required by law to file 990 tax forms with the IRS annually and release those forms upon request. CfA asked EPI for a copy of its 990 on May 30, 2017 and received no response. A search of databases that maintain public copies of 990s, Guidestar and the Foundation Center, returned no results. EPI does not disclose its location (though has criticized CEA for being housed within a PR firm). The only public address for the organization is a post office box in San Francisco. EPI’s website contains information about three employees and one fellow, but according to their LinkedIn profiles, only one of them, the executive director David Pomerantz, is based in San Francisco. 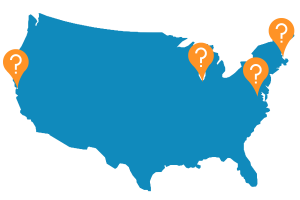 Another lives in Chicago, the third near Boston, and the fellow in North Carolina. All organizations, whether they are for-profit or non-profit, are required to register with the secretary of state or similar office, in the state where they operate. CEA, for instance, is registered with the state of Texas. EPI, however, is not registered in California, or any other state associated with the organization. Finally, EPI’s website is registered through a privacy shielding company based in Panama. The only traceable aspects of EPI are its employees. According to its website, EPI has three current employees, all of whom previously worked for environmental advocacy organizations. The current executive director, David Pomerantz, previously spent eight years at Greenpeace. Research director Matt Kasper worked on the Energy and Environment Policy Team at the Center for American Progress, and the policy and communications manager, David Anderson, spent four years at the Union of Concerned Scientists and a year at Green Alliance. Notably, the founder, former executive director, and current Senior Fellow, Gabe Elsner, has ties to the cleantech industry. Mr. Elsner is currently an MBA student and an intern at Tesla, the parent company of SolarCity, a solar panel manufacturer. "Mr. Elsner, CBP, and its parent organization, Renew American Prosperity (RAP), all have close ties to Tigercomm, a 'cleantech marketing communications, PR and public affairs firm.'" Before working at EPI, Mr. Elsner worked for the Checks and Balances Project (CBP), a nonprofit project that employs similar tactics to EPI in attacking organizations and individuals supported by the fossil fuel industry. Mr. Elsner represented himself to the media as a director of CBP until mid-2013, after which he changed his public affiliation to EPI. On his LinkedIn page, however, Mr. Elsner claims he founded and worked for EPI beginning in 2011, and there is no mention of CBP. Mr. Elsner’s profile describes his work at EPI, in part, as defending “state-level clean energy policies by providing strategy and intelligence to companies and allied organizations.” He also claims to have “executed [a] development plan and raised over $2M from foundations and individuals,” again suggesting EPI is a non-profit organization. Many if not most states require charitable nonprofits to register with the state before they solicit donations, yet EPI does not appear to have filed any such registrations. In 2011, Mr. Elsner became the deputy director at the CBP after having worked as a social media associate at Tigercomm. Tigercomm describes itself as “the top U.S.-based cleantech marketing communications, PR and public affairs firm. CBP’s website describes the organization as the brainchild of Tigercomm’s president, and states that it continues to receive strategic support from Tigercomm. CBP itself is a project of a 501(c)(4) organization called Renew American Prosperity (RAP). In 2014 and 2015, RAP and Tigercomm shared the same office in Arlington, Virginia. In 2015, RAP paid more than 80 percent of its budget directly to Tigercomm for “management.” Tigercomm previously listed both CBP and RAP as clients on its website. Tigercomm itself is openly and deeply tied to the cleantech industry. 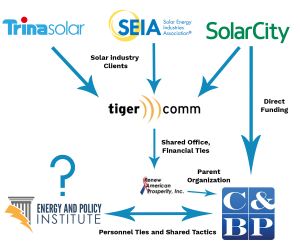 In addition to CBP and RAP, Tigercomm lists several solar companies as well as the Solar Energy Industries Association as clients on its website. In 2015 SolarCity admitted that it funded CBP directly. "A spokesman for the Energy and Policy Institute would not say whether the organization is a nonprofit." ThinkProgress and Utility Dive also covered the report with ThinkProgress describing EPI as “a research and watchdog group,” and Utility Dive incorrectly describing EPI as a nonprofit. Only E&E News asked the group about its nonprofit status, but included the response – that EPI “would not say whether the organization is a nonprofit” – at the end of an article devoted to the group’s report. EPI’s stated purpose is to expose the groups working to advance the interests of the fossil fuel industry, questioning the funding and opacity of these dark money groups. At the same time, however, EPI itself is at least as secretive as the groups it seeks to expose. Journalists should acknowledge the double standard and treat EPI in the same manner as those the group targets. A search of nonprofit donor databases including citizenaudit.org and opensecrets.org revealed no donors for EPI. Consumer Energy Alliance Inc, IRS Form 990, Initial Return 2016, filed February 20, 2017, available at https://consumerenergyalliance.org/cms/wp-content/uploads/2017/02/2016-CEA-990-for-public-use.pdf. Campaign for Accountability searched corporation databases in California, the District of Colombia, Illinois, Maryland, Massachusetts, and Virginia. https://whois.icann.org/en/lookup?name=energyandpolicy.org. The Consumer Energy Alliance’s website is also registered through a privacy shielding company. See https://whois.icann.org/en/lookup?name= consumerenergyalliance.org. This analysis is based on a review of Nexis searches for Checks and Balances Project and Energy and Policy Institute; see also http://checksandbalancesproject.org/about/history. Steven Mufson and Juliet Eilperin, American Petroleum Institute Auditions Do Not Stick to Script, The Washington Post, December 9, 2011, available at https://www.washingtonpost.com/blogs/blogpost/post/american-petroleum-institute-auditions-do-not-stick-to-script/2011/12/09/gIQAy3nliO_blog.html. RAP listed the same address and suite number on its 2014 990, and listed the same address without a suite number in 2015. See Renew American Prosperity Inc, IRS Form 990, Initial Return 2015, available at http://990s.foundationcenter.org/990_pdf_archive/454/454047394/454047394_201512_990O.pdf; Renew American Prosperity, IRS Form 990, Initial Return 2014, available at http://990s.foundationcenter.org/990_pdf_archive/ 454/454047394/454047394_201412_990EO.pdf; http://www.tigercomm.us/contact. See Renew American Prosperity Inc, IRS Form 990, Initial Return 2015, at p. 8 available at http://990s.foundationcenter.org/990_pdf_archive/454/454047394/454047394_201512_990O.pdf. Luige del Puerto and Rachel Leingang, Stump Accuses Critics of Acting Like ‘Mafia’, Arizona Capitol Times, December 10, 2016, available at http://azcapitoltimes.com/news/2015/12/10/stump-accuses-critics-of-acting-like-mafia/. http://www.tigercomm.us/. Thomas Kimbis, Executive Vice President and General Counsel at the Solar Energy Industries Association (SEIA), told CfA, “There is no financial, contractual, or other relationship – direct or indirect – between SEIA and EPI and has never been any to my knowledge.” Email from Thomas Kimbis to Daniel Stevens, Executive Director, Campaign for Accountability, July 10, 2017. Ryan Randazzo, SolarCity Funded Clean-Energy Advocacy Group that Targeted Arizona Utility Regulators, The Arizona Republic, December 12, 2015, available at http://www.azcentral.com/story/money/business/energy /2015/12/13/solarcity-funded-group-targeted-arizona-utility-regulators/77105808/. Diane Cardwell, Even as Wind Power Rises, It Falls Under a Political Cloud, The New York Times, May 30, 2017, available at https://www.nytimes.com/2017/05/30/business/energy-environment/wind-power-base-load.html. Mark Hand, Electricity Customers Pay for Groups that Lobby Against Clean Energy, Report Says, ThinkProgress, May 12, 2015, available at https://thinkprogress.org/group-recommends-greater-oversight-of-trade-group-dues-6a748ee0741d. Gavin Bade, Report: Power Customers ‘Forced’ to Fund EEI Political Activities, Utility Dive, May 10, 2017, available at http://www.utilitydive.com/news/report-power-customers-forced-to-fund-eei-political-activities/442416/. Sam Mintz, Ratepayers Pay for Utility Political Activities — Report, E&E News, May 9, 2017, available at https://www.eenews.net/greenwire /2017/05/09/stories/1060054268. Mary Ellen Klas, FPL Drafted Portions of Bill that Puts Tough Requirements on Rooftop Solar Companies, Miami Herald, April 5, 2017, available at http://www.miamiherald.com/news/politics-government/state-politics/article142904899.html. Ari Natter and Mark Chediak, Messy Battles Over Energy Are on Ballot Across States, Bloomberg, November 1, 2016, available at https://www.bloomberg.com/news/articles/2016-11-01/messy-battles-over-energy-are-on-the-ballot-across-u-s-states.